In October 1955, not to long after Robert Waldsmith had bought the Hirohata Mercury, the car was sideswiped, and the entire left side was severely damaged. Like most car people, I always feel sad when I see this photo of the wrecked Hirohata Mercury. It’s hard to believe that something like this happened to such a wonderful custom car. But it does show that these custom car icons were part of everyday traffic back then. More than often they were used for daily transport. When looking at this photo, one has to have a lot of respect for the body man, who was able to fix the car like nothing had ever happened to it. Today, when you look at the Hirohata Mercury, and tell people the entire left side was once severely damaged, nearly nobody would take you seriously. Nothing from this tragedy can be seen on the car anymore. 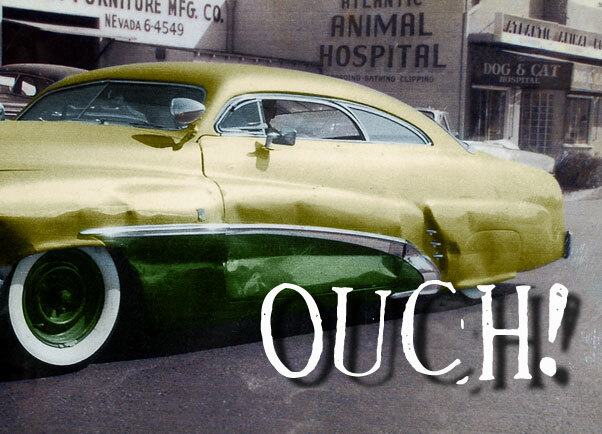 This 1955 photo however, makes you wonder how the people at the Barris shop must have felt when they saw the damage on the car. Only three years previously, the Barris team worked so hard to create one of the most stunning custom cars in a very short time. And now one side was wiped out. Most people had never heard about this wreck with the Hirohata Mercury until a photo of the damaged Hirohata Mercury appeared in the Rodder’s Journal #8 article on the Hirohata mercury. And the story about it was almost not told at all if it had not been for Tim Cunha bumping into a Robert Waldsmith at an Salinas, Ca. hospital. Robert Waldsmith was the administrator at this hospital and Tim was the regional manager for a contracting company for Rehabilitation Services in hospitals etc. When Tim and Robert were talking in the hospital office Robert started telling Tim about this Custom Mercillac he once had. He said it was in the Running Wild movie with Mamie van Doren. Tim told him to prove it……….. Well he did, the next day he brough a box of photos. Also the bill for the repair of the Merc from Sam’s Auto Body Works after he got it side swiped. Sadly non of this material was copied or scanned at the time. But Tim Cunha did call Pat Ganahl who later got in touch with Robbert Waldsmith and was able to get one photo of the car showing the damage and one of the Hirohata mercury towing a boat from Robert. 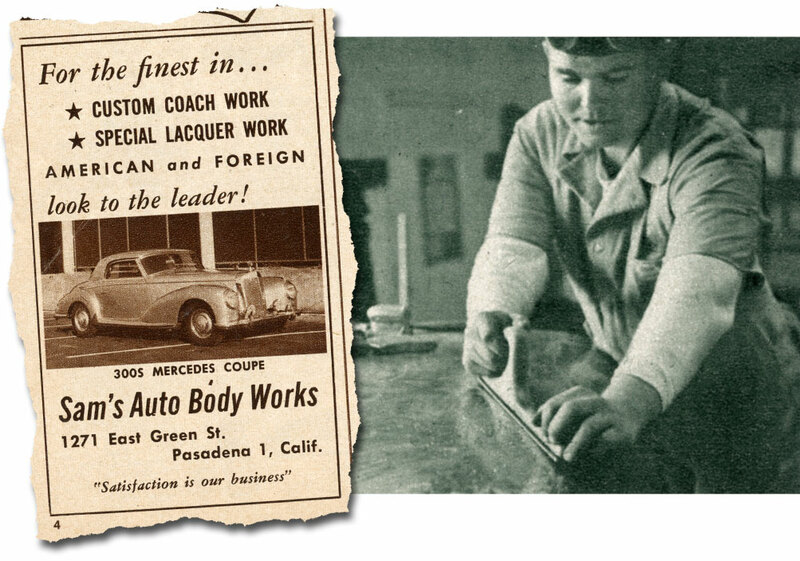 These photos ended up in the Rodder’s Journal article, and we really have to thank Tim Cunha for getting in touch with Robert, and passing on the information so that this sad part of the story is part of the history of the Hirohata merc and not lost for ever. Tim remembered that the photo Robert showed of the damage was just a very small snapshot. 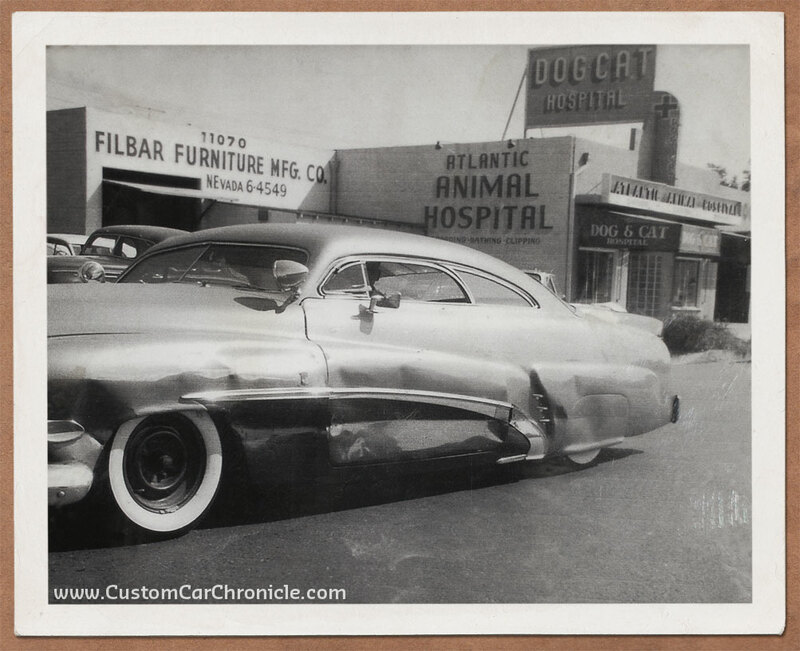 The photo above was taken in front of the Barris Kustom shop in October 1955, the car was then owned by Robert Waldsmith. 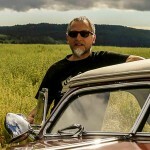 Robert had bought the car, shortly before or after it was used in the movie ‘Running Wild’. Bob Hirohata had been advertising the car for sale for some time. When George Barris made the arrangements to have the car in the movie he was asked to repaint the car so it would show up better in the black and white movie. The Mercury was repainted lime green metallic, and dark green below the Buick trim, and that is how it was when the accident happened. After the movie shoot, Robert put his new custom in several shows, but he also used his new car a lot as daily transportation. In October 1955, he was hit by a car that left his lane, and crossed the center line on Riverside Drive in Burbanks. The two cars got in contact, and most of the drivers side was pretty beaten up, as can be seen in this photo. Robert wanted Barris to fix the damage for him, but in the end, they asked too much money to do the work. He brought the car over to Sam Gates Sam’s Auto Body Works in Pasadena. Sam was known for his fine work on the R&C Dream Truck. Sam did the repair work on the drivers side, and ended up repainting the car in bright gold with a dark gold under the Buick side trim. In the photo of the Mercury from the movie as well as the accident we can see the car has a door mounted side view mirror. This mirror was not on the car when Bob Hirohata owned the car, nor when he advertised the car (See photo). The mirror was most likely put on by Robert, to allow him to tow his boat. But it could also be possible that the mirror was added to help the actors in the movie Running Wild to improve viability in the chopped car. When Jim McNiel bought the car the side view mirror was removed by a previous owner (most likely Dirty Doug Kinney). He never filled the mirror mounting holes left in the door, and created a brass plate with a new name for the car. A brass crest with the name “The Hawaiian” has been covering the former rear view mirror holes. This Hawaiian crest is still on the car today. When I saw the Hirohata Mercury for the first time in 2009 I could not detect any signs of this body damage on the completely restored car what so ever. Sam Gates did a fantastic job repairing this Milestone Custom in the mid 1950’s. Sam Gates working on the top of the R&C Dream Truck which he chopped. On the left his business ad he ran in Rod & Custom Magazine. 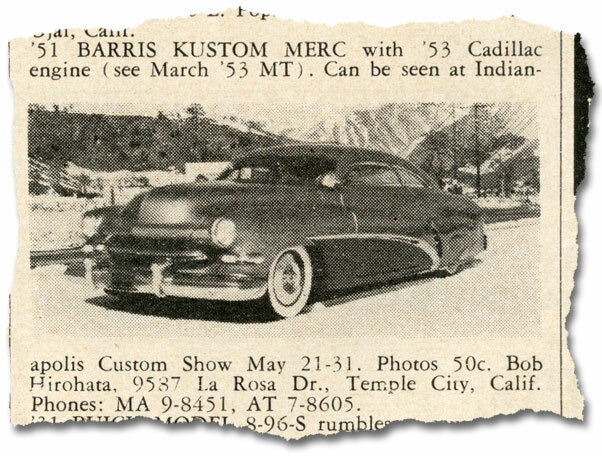 One of the magazine ad’s Bob Hirohata ran to try and sell his 1951 Mercury custom. 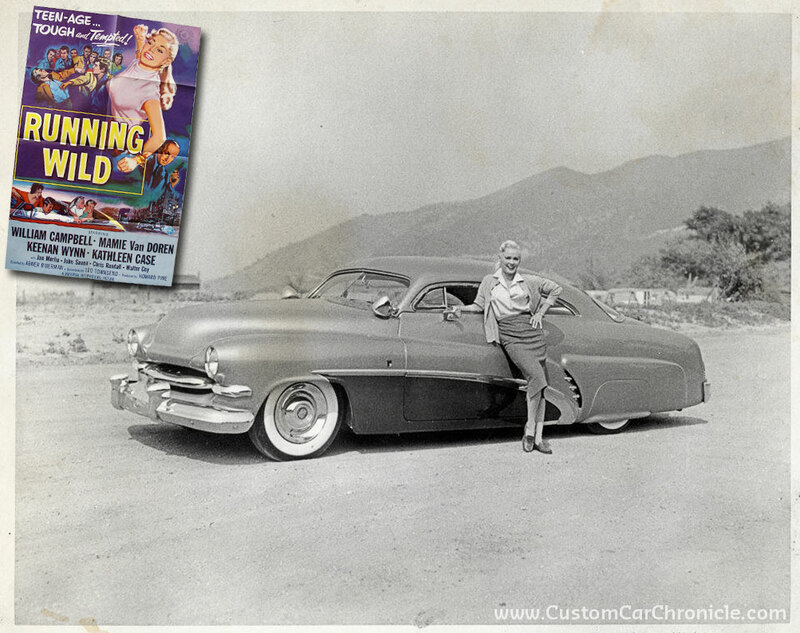 This photo in the ad shows the car has already been repainted for the movie. It also ran 1953 Cadillac hubcaps then, but there was no side view mirror. Actress Mamie Van Doren posing with the Hirothata mercury during the time the movie Running Wild was shot. Note that the side view mirror has been added at this time. Also note that the car was now running ’48-’50 Cadillac Sombrero hubcaps again, similar to when the car was first build in 1952. 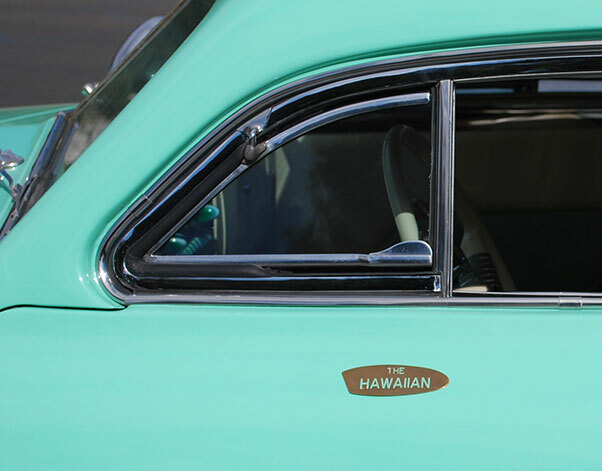 The Hawaiian crest that was created in the early 1960’s hides the mounting holes of the side view mirror. This photo was taken in 2011.
what a nightmare !!! such a beautiful and unique kustom with all the driver side destroyed! Sam gates did a really nice job!